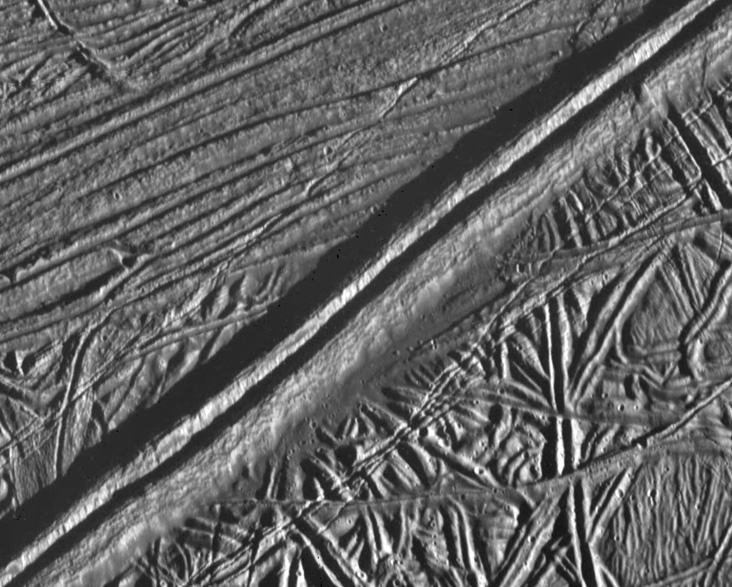 Europa is one of the smoothest and most reflective objects in the solar system on account of its young icy surface which scientists believe harbours a global ocean of saltwater! 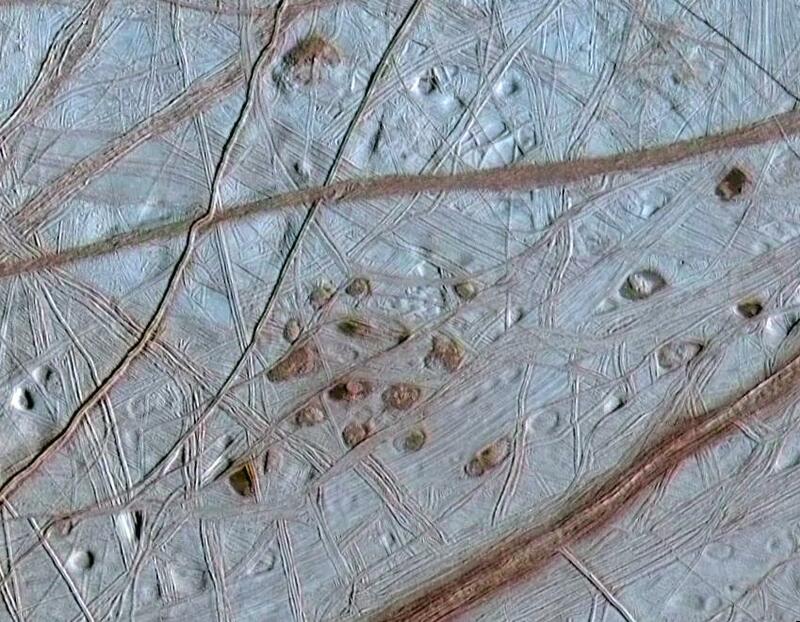 Europa’s discovery in 1610 (along with the other Galilean Moons) played a significant role in the advancement of astronomy and our understanding of the solar system and may do so again if its subsurface ocean is revealed to be inhabited by alien life! 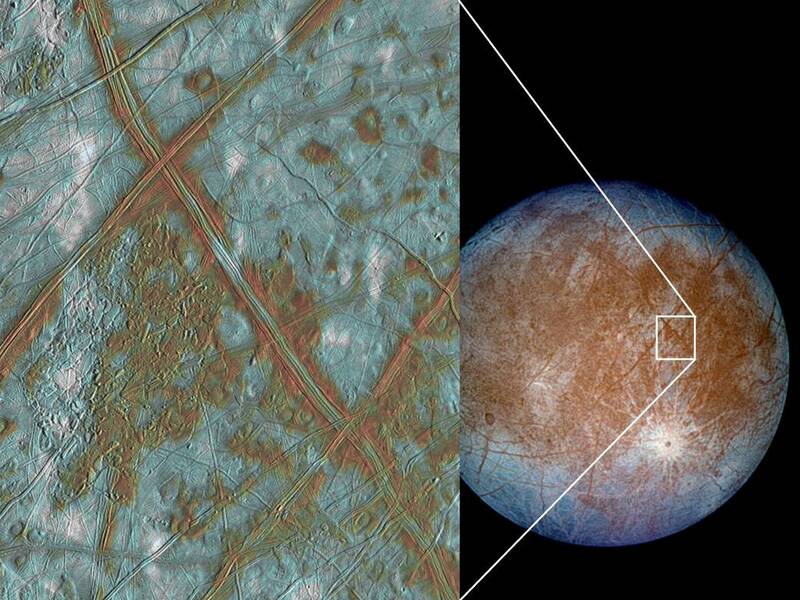 Fast Summary Facts About The Moon Europa! 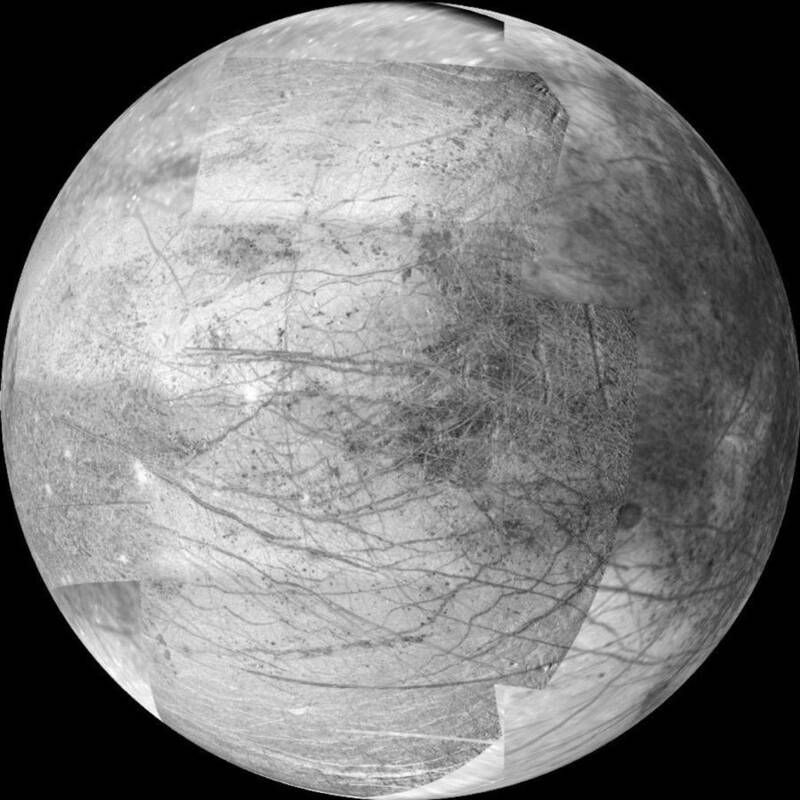 Read More Interesting Facts About Gigantic Ganymede! 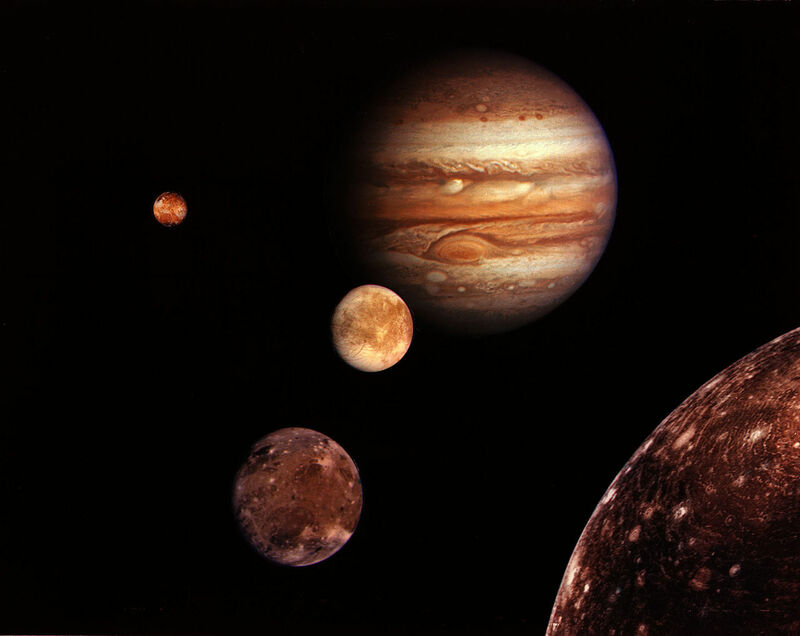 The discovery of Europa, and the other Galilean Moons in 1610, was the first time an object was observed to be orbiting another planet and lead to the understanding that the planets orbited the Sun and not the Earth! 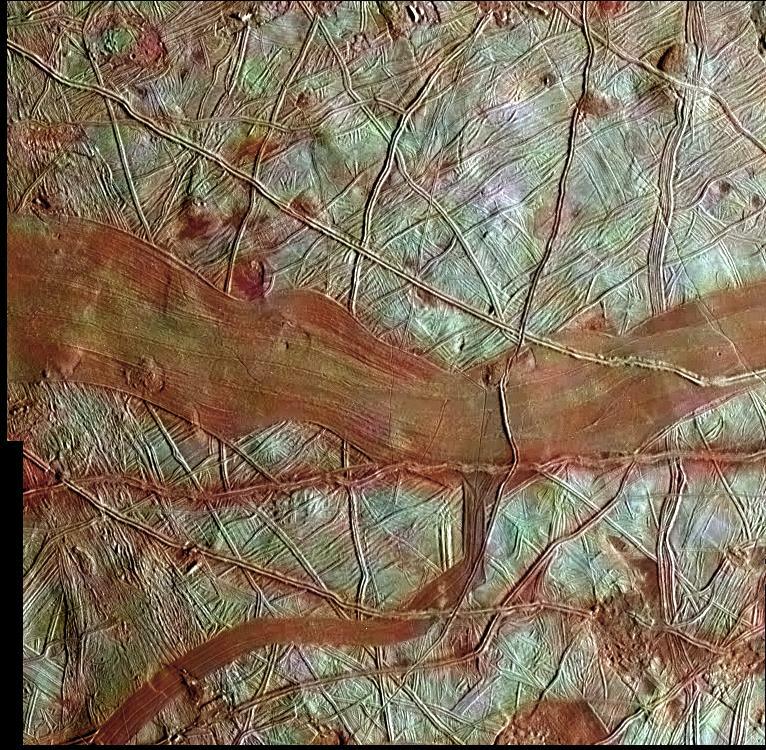 Like several other differentiated icy moons, Europa is believed to be made up of four main layers; a metallic iron-nickel core, a mantle of rock, a salt-water ocean and a shell of mostly ice that maybe between 80 - 170 km thick! 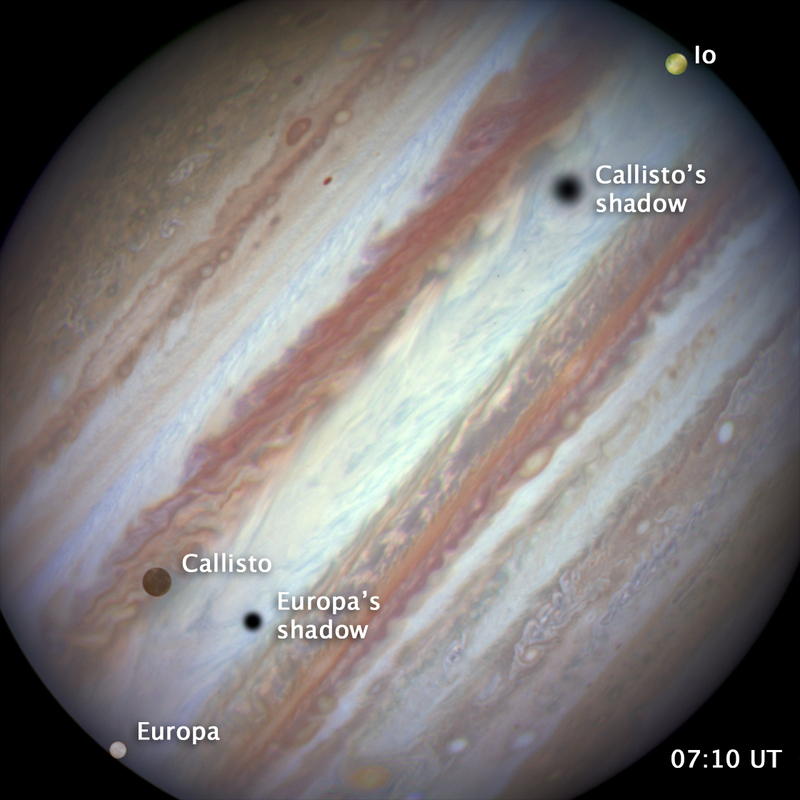 Europa is locked in a 1:2:4 orbital resonance with the Galilean moons Ganymede and Io. 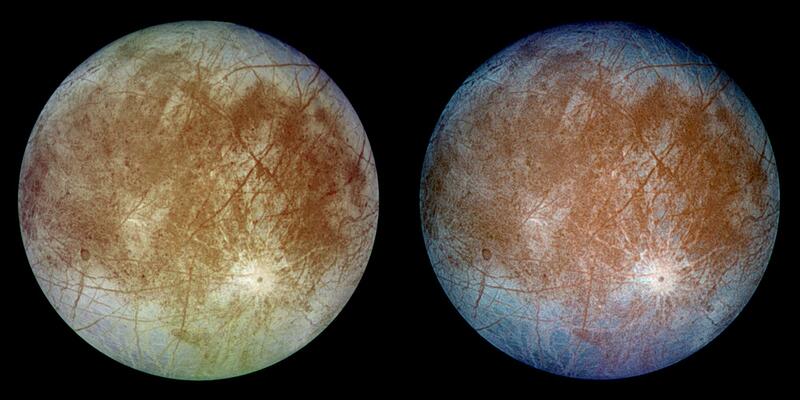 Europa completes 2 orbits for every 4 that Io and 1 that Ganymede completes. 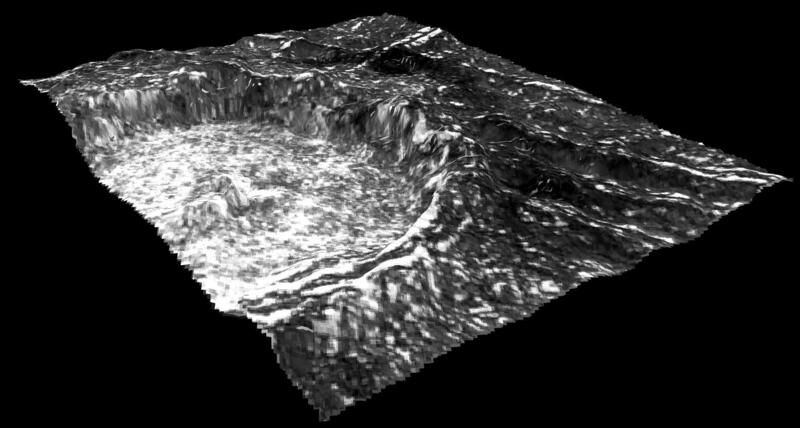 Scientists believe that much of the surface geology (and likely presence of a liquid ocean) is the result of tidal forces which results in tidal heating and flexing similar to that which occurs on the neighbouring moon Io. 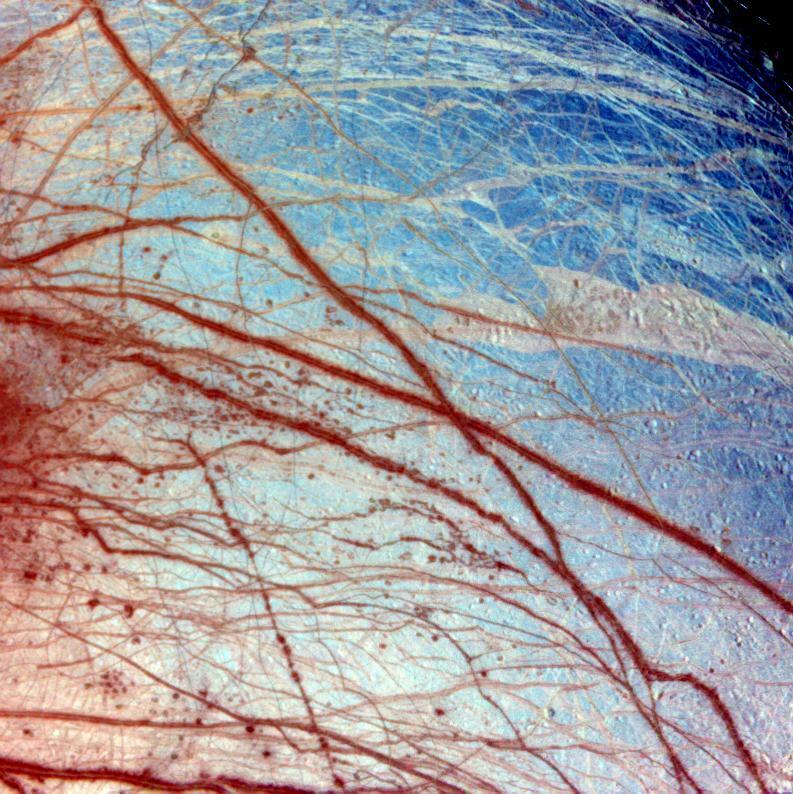 It is believed that if a subsurface ocean and a heat source (similar to those in Earth’s deep oceans) does indeed exist on Europa, then extraterrestrial life may exist as well, and if discovered, would likely be the greatest discovery in human history! How cool that would be to know there’s Alien life within our own solar system! 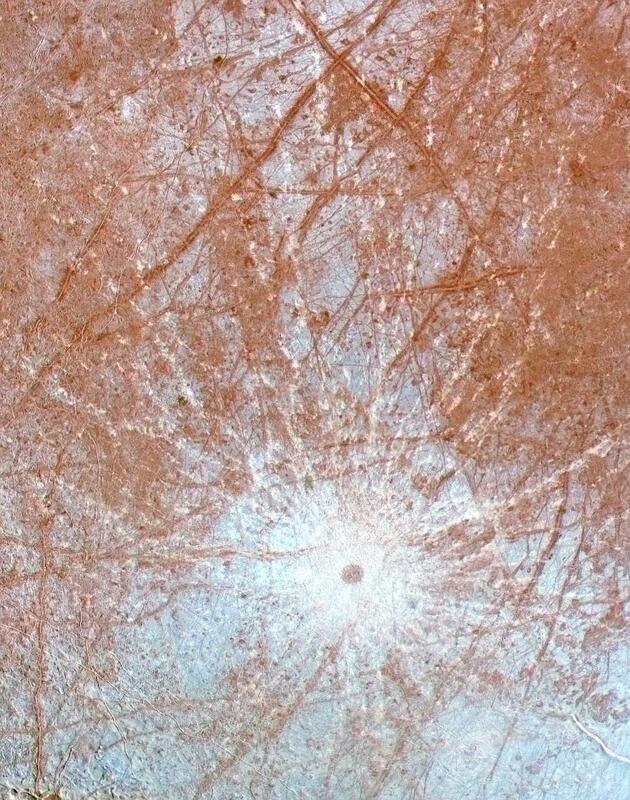 Europa's surface is primarily composed of relatively young (no more than 40 to 90 million years) water-ice meaning its albedo — the measure of light reflectivity — is one of the highest of any known moon in the solar system! 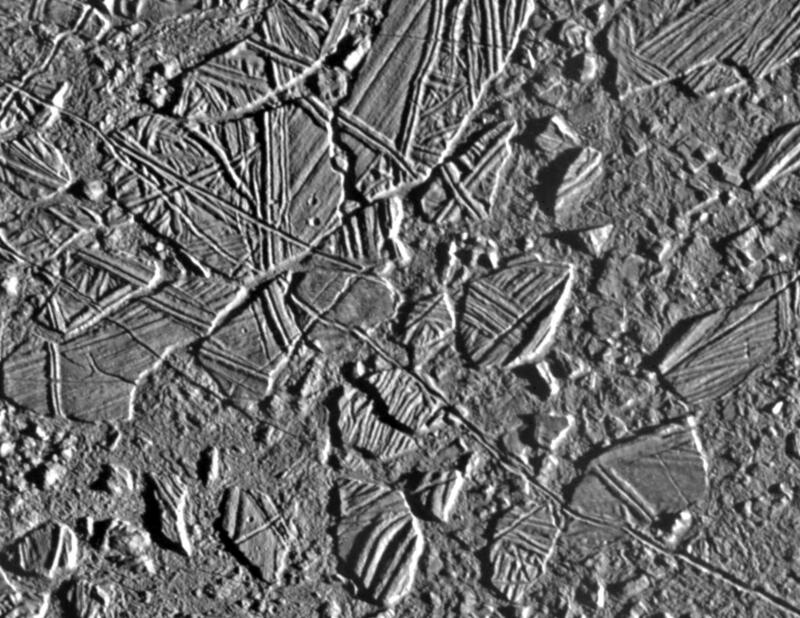 The surface is also the smoothest known surface in the solar system, but is still crisscrossed by long straight fractures, poorly understood ‘pits and domes’, chaotic areas of broken blocky terrain and several bright young impact craters such as the Pwyll crater and the Tyre Structure. 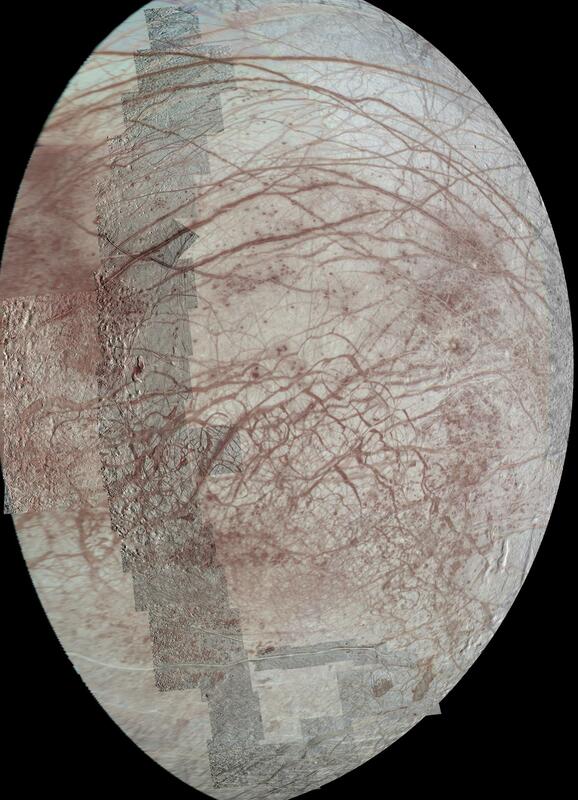 The Hubble Space Telescope observed in 1995 that Europa has a very thin atmosphere composed of oxygen. NASA believes it has observed geysers erupting water vapour above the moon’s surface from its polar region; similar to the geyser activity seen on Saturn’s Moons Enceladus! 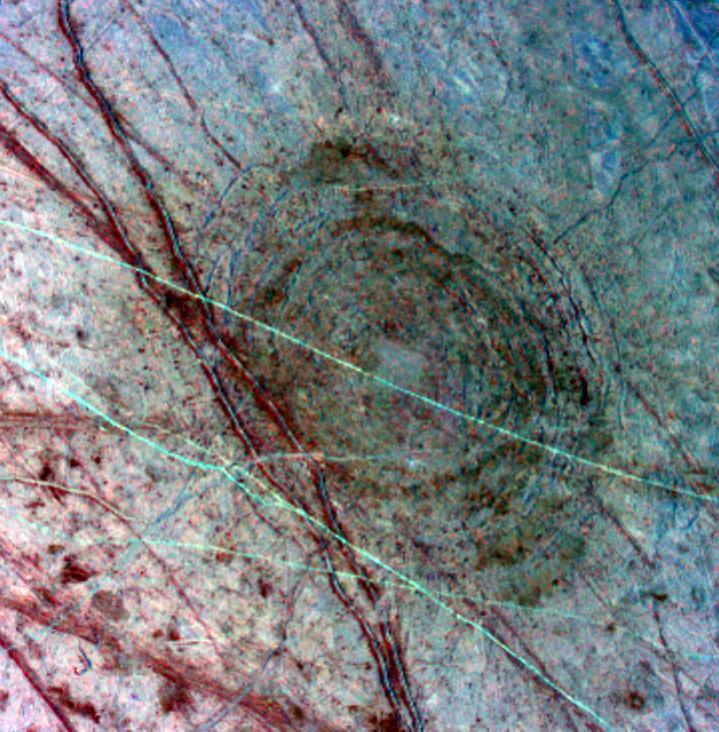 Europa is believed to have formed by the accretion of the gas and dust that surrounded Jupiter after the planet was formed during the solar system's formation 4.5 billion years ago. 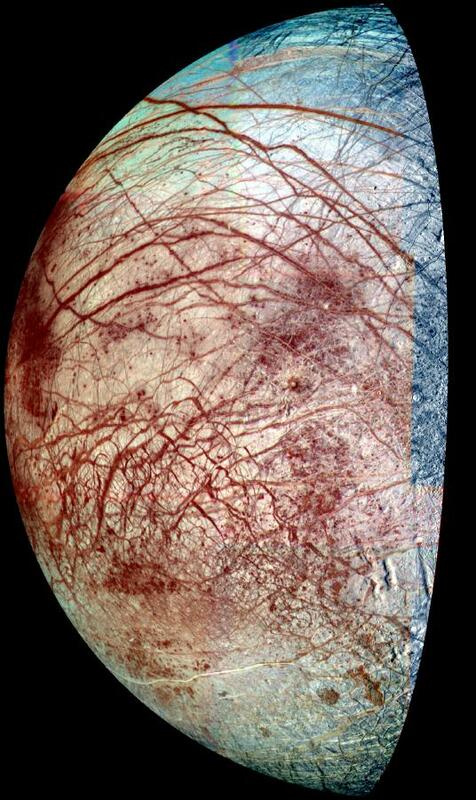 The Pioneer 10 spacecraft was the first to image Europa with Voyager I and Voyager II imaging the moon in more detail. 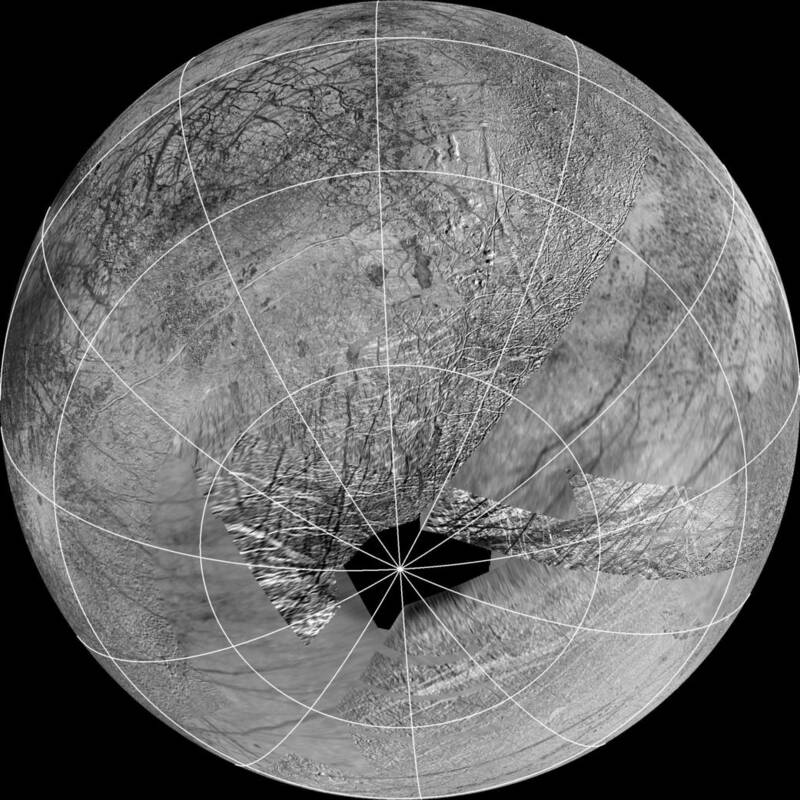 Additional observations were made during the New Horizons flyby in 2007. 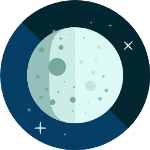 The first Jupiter orbiter, the Galileo probe, made extensive studies of the moon during its 8 years orbiting the gas giant. 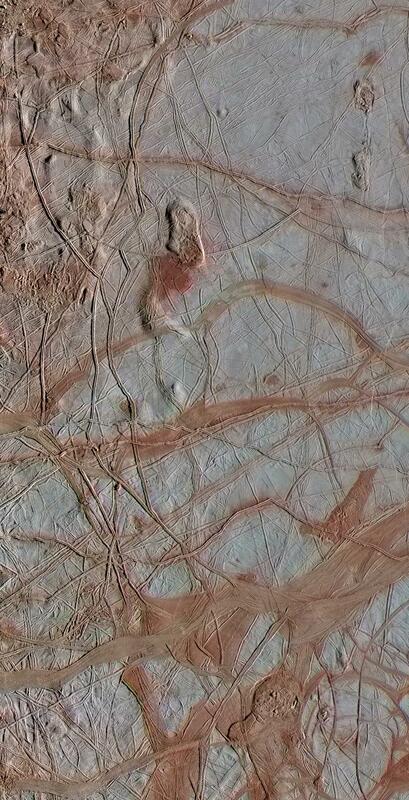 Due to Europa’s possible habitable subsurface environment, it is a high priority target for future space probes. 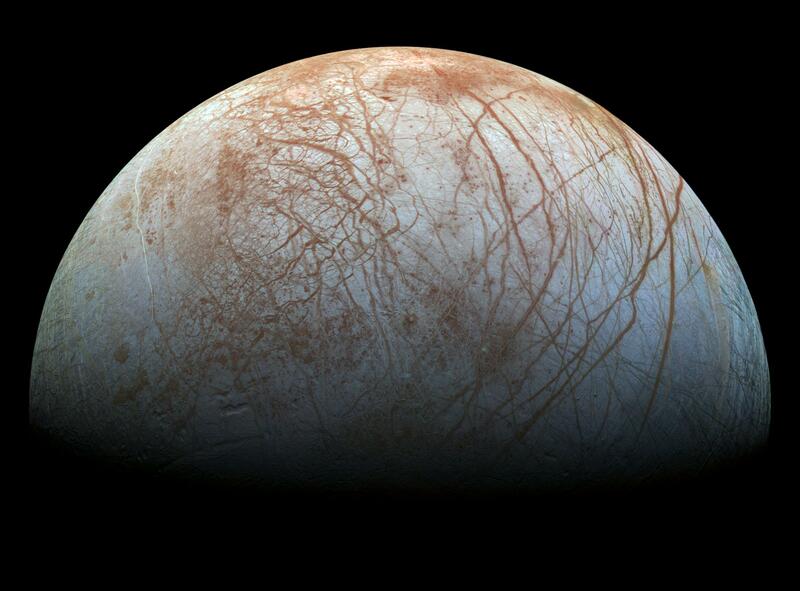 Two specific missions to study the icy moon are planned to launch; NASA’s Europa Clipper and ESA's JUICE mission (JUpiter ICy Moons Explorer) which will launch for the Jupiter system in the late 2020’s. 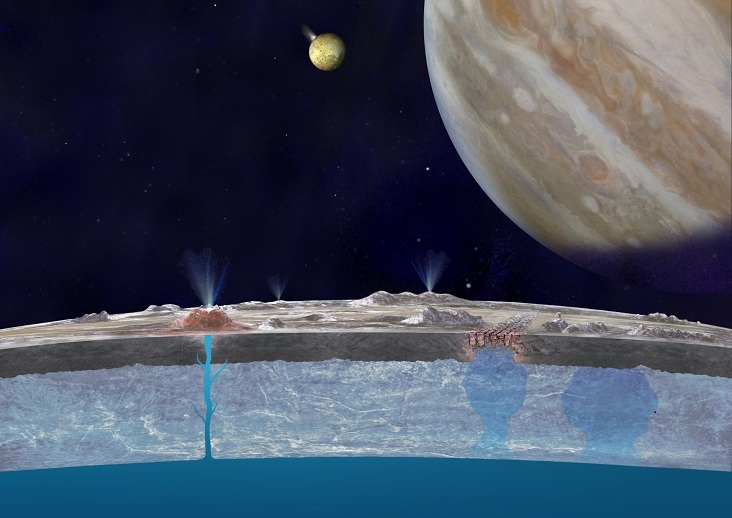 In addition to these flyby missions, a NASA lead mission for a 'Europa Lander' probe has been proposed to study Europa’s composition, its icy shell, subsurface ocean and geology. Incredible Facts On The Huygens Titan Landing Probe!